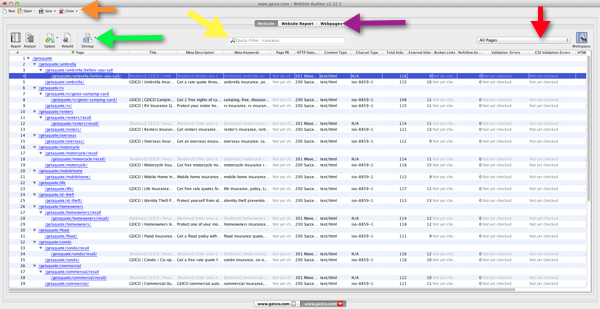 Website Auditor is one of the 4 tools found in Link-Assistant's SEO Power Suite. 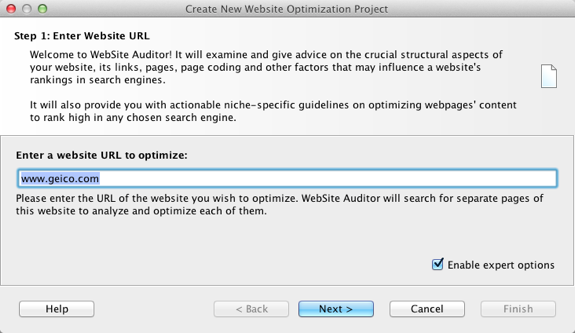 Website Auditor is Link-Assistant's on-page optimization tool. 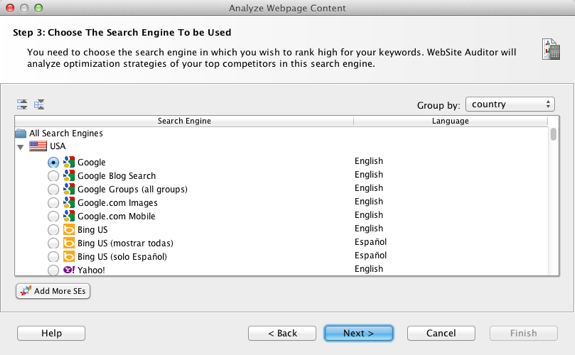 We recently reviewed 2 of their other tools, SEO Spyglass and Rank Tracker. 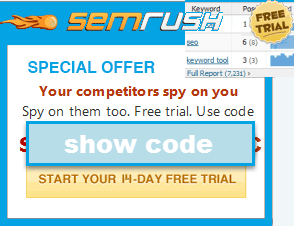 You can check out the review of SEO Spyglass here and Rank Tracker here. 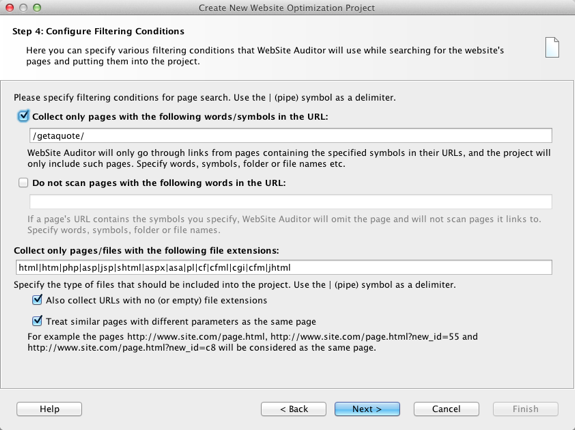 What Does Website Auditor Do? Website Auditor crawls your entire site (or any site you want to research) and gives you a variety of on-page SEO data points to help you analyze the site you are researching. We are reviewing the Enterprise version here, some options may not be available if you are using the Professional version. In order to give you a thorough overview of a tool we think it's best to look at all the options available. You can compare versions here. Your next option is to select the crawl depth. 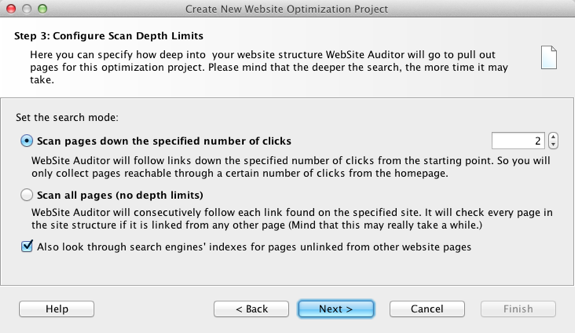 For deep analysis you can certainly select no crawl limit and click the option to find unlinked to pages in the index. If you want to go nuts with the crawl depth frequently, I'd suggest looking into a VPS to house the application so you can run it remotely. Deep, deep crawls can take quite awhile. I know HostGator's VPS's as well as a Rackspace Cloud Server can be used with this and I'm sure most VPS hosting options will allow for this as well. I'm just going to run 2 clicks deep here for demonstration purposes. 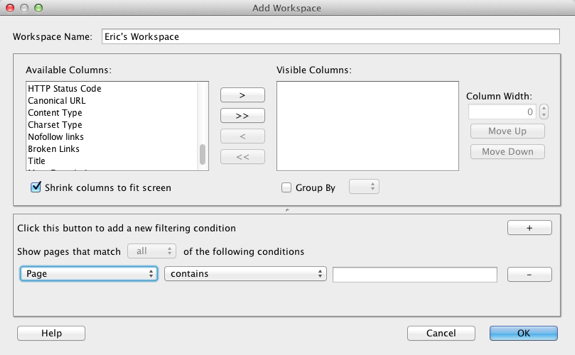 Next up is filtering options. Maybe you only want to crawl a certain section or sections of a site. For example, maybe I'm just interested in the auto insurance section of the Geico site for competitive research purposes. Also, for E-commerce sites you may want to exclude certain parameters in the URL to avoid mucked up results (or any site for that matter). Though there is an option (see below) where you can have Website Auditor treat pages that are similar but might have odd parameters as the same page. So here, I'm included all the normal file extensions and extension-less files to include in the report and I'm looking for all the stuff under their quote section (as I'm researching the insurance quote market). 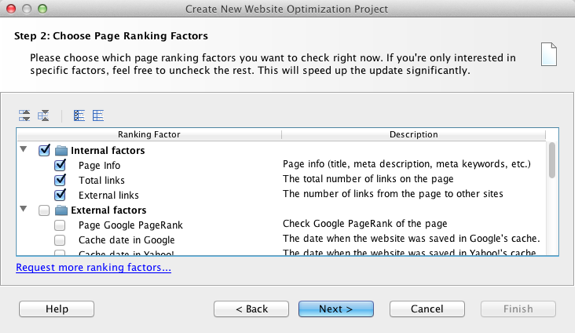 Green - you can build an white-labeled Optimization report (with crawl, domain, link, and popularity metrics plugged in), Analyze a single page for on-page optimization, Update a workspace or selected pages or the entire project for selected factors, Rebuild the report with the same pages but different factors, or create an XML sitemap for selected webpages. 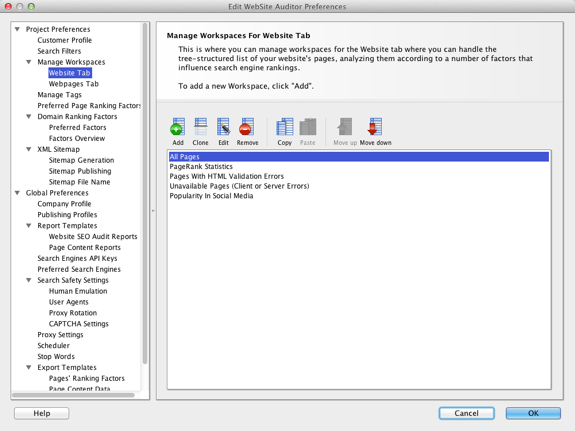 Spending some time upfront playing around with the Workspace options can save you loads of time on the backend with respect to drilling down to either specific page types, specific metrics, or a combination of both. 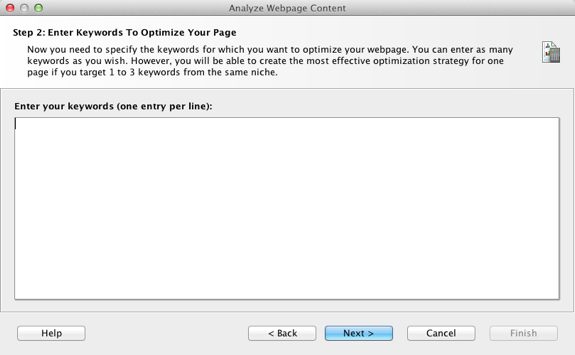 You can analyze a page's content (or multiple pages at once) for on-page optimization factors relative to a keyword you select. Enter the keywords you want to evaluate the page against (I entered boat insurance and boat insurance quotes) then select what engine you want to evaluate the page against (this pulls competition data in from the selected engine). You have the option to view the results by a single keyword (insurance) or multi-word keywords (boat insurance) or both. Usually I'm looking at multi-word keyphrases so that's what I typically select and the report tells you the percentage the keyword makes up of a specific on-page factor. 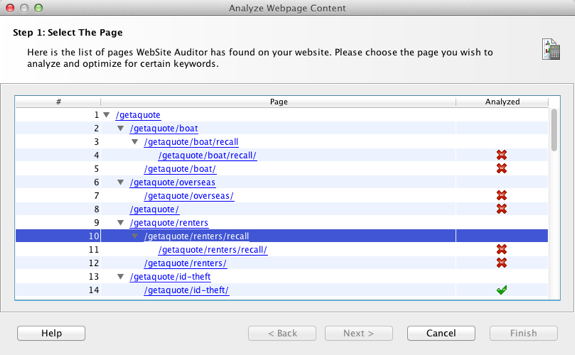 Website Auditor takes all that to spit out a custom Score metric which is mean to illustrate what keyword is most prominent, on average, across the board. You can create a white-label report off of this as well, in addition to being able to export the data the same way as the Page Factor data described above (CSV, HTML, XML, SQL, Cut and Paste). 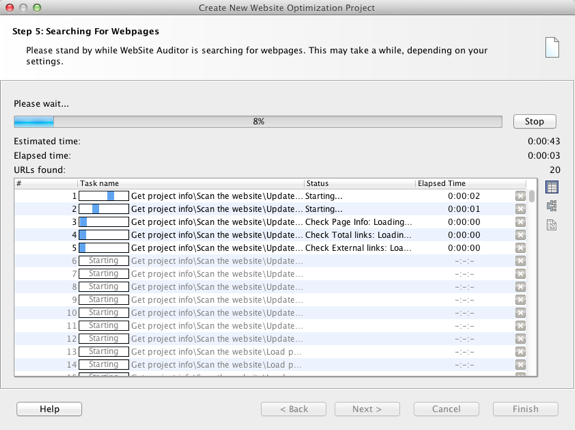 You have the option to set both global and per project preferences inside of Website Auditor. Website Auditor also offers detailed reporting options (all of which can be customized in the Preferences area of the application). 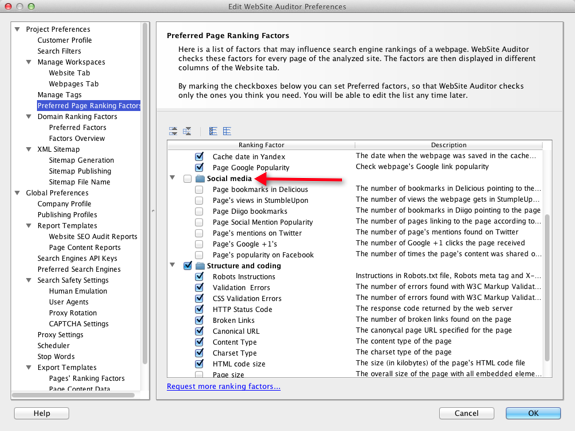 You can get customized reports for both Page Factor metrics and Page Content Metrics. I would like to see them improve the reporting access a bit. The reports look nice and are helpful but customizing the text, or inputting your own narratives is accessed via a somewhat arcane dialog blog, where it makes it hard to fix if you screw up the code. I've asked for clarification on this but I believe their Live Plan (which you get free for the first 6 months) must be renewed in order for the application to interact with a search engine. I do hope they consider changing that. I understand that some features won't work once a search engine changes something, and that is worthy of a charge, but tasks like pulling a ranking report or executing a site crawl shouldn't be lumped in with that. Nonetheless, I would still recommend the product as it's a good product and the support is solid but I think it's important to understand the pricing upfront. You can find pricing details here for both their product fees and their Live Plan fees. Hi guys thanks for another great review! Whenever a Live Plan expires, WebSite Auditor (as well as other SEO PowerSuite tools) will continue functioning AND collecting search engine data (though that data may be slightly inaccurate, or completely off if a major search engine algo change takes place). That's so awesome to hear! Cheers to you for changing that around and thanks!